Few ideas, less hope leave Syria crisis on back burner at U.N.
People walk near damaged buildings in the Syrian city of al-Bab, Syria September 20, 2017. UNITED NATIONS - At the entrance to the United Nations building in New York a sign advertises an upcoming party to celebrate the end of the annual gathering of world leaders. Next to it a weathered box with crumpled papers urges people to donate for Syrian refugees. The contrast is striking a year after nations jousted verbally for a week in the same halls attempting to strike a ceasefire deal as Russia and Iran backed Syrian government troops in a brutal advance on the then rebel bastion of Aleppo. But tensions in the Korean Peninsula and a growing crisis over the fate of a nuclear agreement between Iran and world powers has relegated talk of resolving the six-year-old Syrian civil war to back rooms and bilateral chitchat as international diplomacy struggles to find a strategy to end the crisis. On the ground, violence between government forces and rebels has been drastically reduced after the creation of ‘de-escalation zones’ in the west of the country negotiated between Russia, Turkey and Iran in Astana, the capital of Kazakhstan. A separate effort between Russia, Jordan and the United States has also helped in the south. Its backers say the zones have restored some security to Syrians and open the way for local reconciliation. Its detractors warn that they will fragment the country and lead to a more radicalised opposition. “You don’t have the U.S. and the Europeans around the table and that is a huge defeat for all of us. This Astana process is just a military de-escalation process and it must be supplemented with a political process,” French President Emmanuel Macron, whose country supports rebels and urges the departure of Syrian President Bashar al-Assad, told reporters this week. But there appears little momentum for that. While all actors in the conflict agree on the common goal of defeating Islamic State and al-Qaeda-backed militants, an objective that is well on course, there is no consensus on how to breathe fresh life into the political process. That has been compounded by the arrival of the Trump administration whose priority in Syria is focused on destroying Islamist groups and curbing Iran’s influence. Meanwhile, they have reduced support for some opposition groups. “The American withdrawal has left Russia dominating the entire process,” Riad Hijab, the head of the opposition High Negotiations Committee (HNC), told Reuters in New York. The last major international attempt to resolve the crisis ended in failure when the International Syria Support Group (ISSG) was cast aside after Syrian government forces retook Aleppo in 2016. U.N.-brokered peace talks in Geneva that have pitted a government delegation against a divided opposition for several years with the ultimate aim of implementing an existing U.N. roadmap have been kept on life-support as sponsors of the warring parties fail to pressure them to engage in dialogue. “The question is, are these de-escalation areas going to be limited for six months or do they risk becoming a de facto partition of Syria?” U.N. special envoy Staffan de Mistura told a sparsely attended meeting on the crisis. Those talks are tentatively scheduled to resume at the end October. There is growing pressure on the Riyadh-based opposition, which has suffered repeated reversals since the start of the year, to restructure by including groups that have closer ties to Russia, but also shaking up its top leadership. Western and Arab diplomats argue that it aims to merely strengthen Moscow’s hand in any future negotiating process. “Now that the opposition no longer has the hope to win the war, things can be different, but if we put up a fragmented, demoralized and radicalised opposition in Geneva versus a regime that, while weak, believes it can win, then nothing will happen in Geneva,” a senior European diplomat said. But after a week at the United Nations, there was little sign of progress. A French effort to get the five permanent members of the Security Council - Britain, China, France, Russia and the United States - to talk to each other yielded no concrete results. “There’s a lot of wariness and mistrust from Russia who think we have a hidden agenda and the United States ... who are obsessed with Iran,” said a senior French diplomat. How Russia and Iran see the political evolution remains unclear given their interests and influence in Syria have never been greater. Speaking at the high-level Syria meeting, Russia’s Deputy Foreign Minister Gennady Gatilov pushed for a new round of Geneva talks. 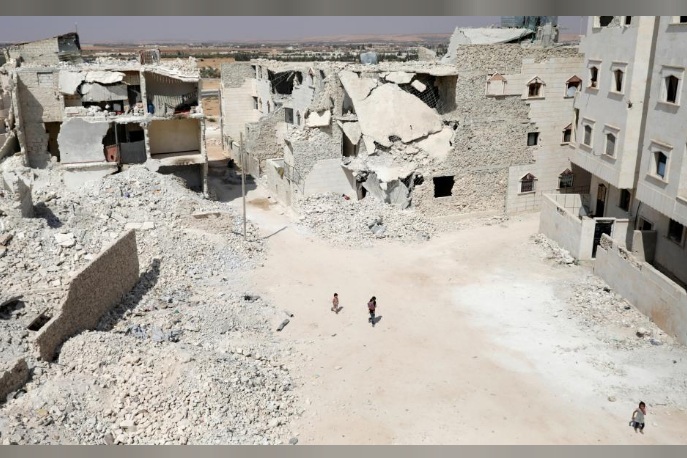 However, he condemned as “unacceptable” the West’s attitude in refusing to help fund reconstruction of areas taken back by Syrian government-backed forces, a sign perhaps that Moscow is concerned about its long-term role in the country. The United States, Britain and France have all dismissed that idea, believing they can use the promise of reconstruction to push Assad and his allies to the negotiating table. “Absent a credible political horizon that can lead to a transition that’s supported by a majority of the Syrian people, the reality is the international community will not be coming in with significant reconstruction assistance,” said Brett McGurk, U.S. special envoy for the coalition against Islamic State. Muslim Global: Few ideas, less hope leave Syria crisis on back burner at U.N.
At the entrance to the United Nations building in New York a sign advertises an upcoming party to celebrate the end of the annual gathering of world leaders. Next to it a weathered box with crumpled papers urges people to donate for Syrian refugees.